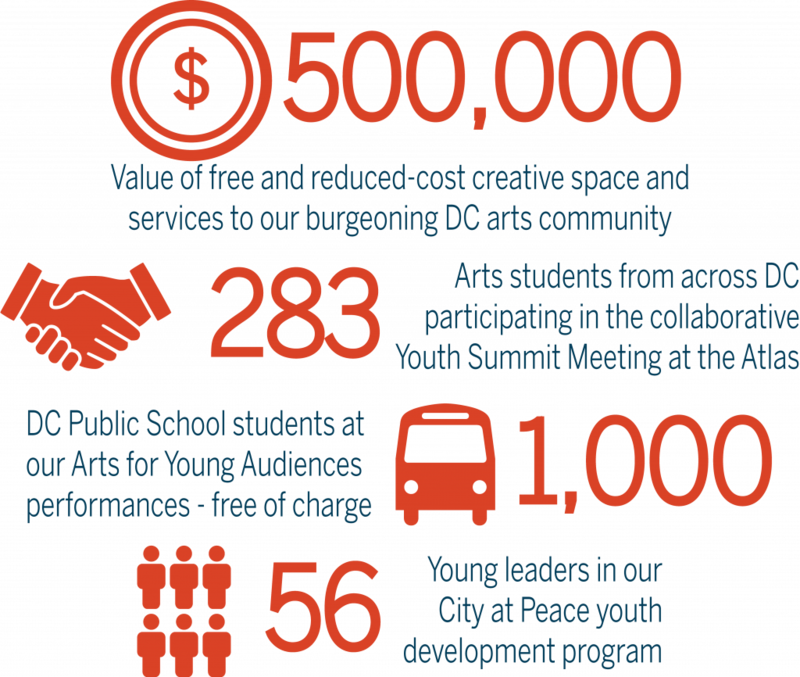 The Atlas is a performing arts center like no other, rooted in community and created as a catalyst for growth, change and development on the H Street corridor. Since opening our doors 12 years ago, the Atlas has remained dedicated to impacting the community through arts, culture and connection, inspiring creative joy for all. This past year, the Atlas and our Resident Arts partners provided free and reduced-cost programming and services for our community throughout the region valued at $2.2 million dollars. Your commitment to the Atlas keeps our doors open to the community and keeps ticket prices affordable. The Atlas is where arts, culture, and connection happen on H Street and your contribution helps sustain our efforts as a community-focused arts organization. There are many ways to support the Atlas, become a member, an individual donor, or a corporate sponsor. When you give, you support the programs and services that makes the Atlas thrive. The Atlas Performing Arts Center is a 501(c)3 nonprofit organization. Our EIN is 52-2358563. Contact the Development Office by calling 202.399.7993 ext 122 or by emailing development@atlasarts.org.